A soaking bathtub, one of life’s simplest luxuries, is a cost-effective way of giving your bathroom a facelift. Lucky for us, today’s soaking tubs do more than soak. For instance, you can customize them for a full spa-like experience in the comfort of your home. The best soaking tub is a sure ticket to satisfying most, if not all, of your expectations. But with the wide variety of styles, sizes, and materials to choose from, getting the right one can be a bit tricky. Now, this is the point where we come in to make it easier on you. This article reviews the best soaking bathtubs currently available on the market. Plus, we provide a buying guide to narrow down your choices. Looking good so far, well, there are far bigger things awaiting. Let’s cut the introduction and find out! We have a selection of seven bathtubs, but with stiff competition among them. It’s up to you to read a comprehensive review of each and choose the one that works best for you. After all, it’s all a matter of personal choice, isn’t it? 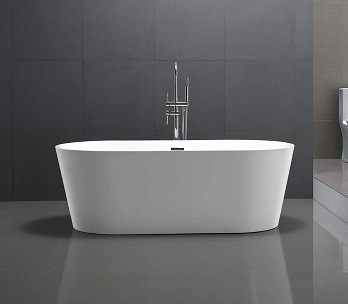 Ferdy 67-inch tub is a modern masterpiece with a unique, interior curvature. It’s a bathtub that compliments most bathroom decor and styles. 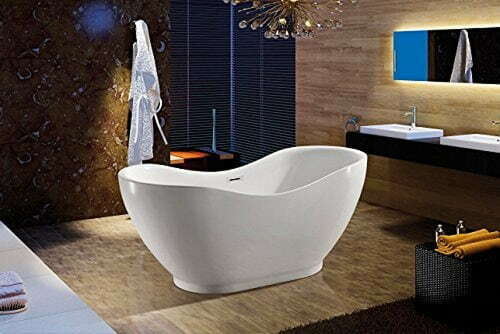 The tub is glossy acrylic with fiberglass reinforcement, an excellent combination for long lasting durability. A two-piece (inner and outer shell) construction insulates better allowing the water to stay warm for longer. This tub is an oval, stand-alone variety. It has a standard width of 32 inches, enough to leave some extra room for the average size person. At 67 inches, the length is longer than standard to provide more room for stretching. The soaking depth is a generous 15.7 inches at the full capacity of 86 gallons. A stainless steel bracket combines with the sturdy structure to support up to 800kg. Ferdy tub has a slight tilt towards the drain for faster, self-cleaning discharge. The drain pipe is a flexible 12 to 32 inches, which compensates for misalignment between the overflow and drain. An anti-slide washer provides a leakproof seal. Drain and overflow components are made of plastic, brass, and chrome to resist rust and corrosion. Adjustable, leveling feet allow the tub to sit sturdy, even on uneven surfaces. Ferdy 67-inch is an affordable tub that’s lightweight, durable, and holds heat well. It’s a complete package that includes the drain and overflow assembly. Remember, it’s a stand-alone tub, so space is quite crucial. A premier bathtub from a premier brand with a solid reputation. It has the feel of old metal tubs, but with a deeper soak. American Standard Cambridge tub comes in a timeless, traditional style. It boasts a glossy, durable finish that provides a more sanitary option over the old rustic luxury. Porcelain enamel, metal-grade enamel, and reinforcement layers provide the thickness and insulating properties of cast iron. But it’s a much durable, lighter, and affordable alternative to cast-iron varieties. The surface is slip-resistant for a firm hold. An integral apron complete with a beveled headrest and lumbar support beckons you to sit back and relax. It’s a space-saving alcove tub great for small bathrooms. You can tuck it between three walls or install lengthwise along a non-load bearing wall. The tub measures 32 inches wide and 60 inches long, a moderate size that fits most alcoves. It soaks to a depth of 14 inches, enough to cover every inch of your body if the need arises. The inside bottom has a non-slip textured surface. You can flush-fit a shower door with ease, thanks to a flat ledge. The bottom edges have a slight concave for extra stability. At 118 pounds, the tub is sturdy yet easy to pick up. 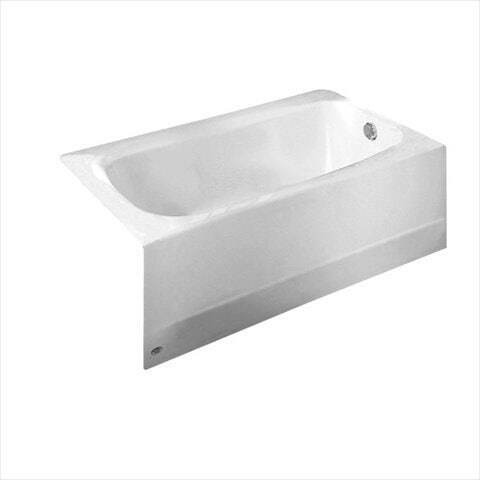 American Standard Cambridge tub features outstanding durability. Plus, it adds a timeless look to your bathroom. It makes an ideal space-saving option, especially for small bathrooms. 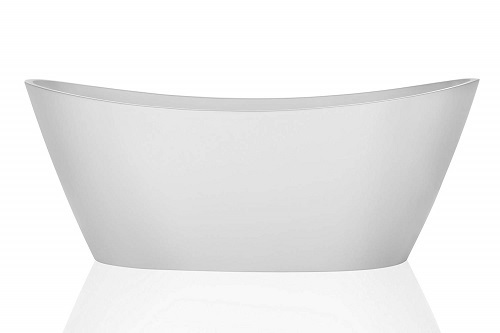 Woodbridge 67-inch tub is a contemporary beauty, one that matches most bathroom settings. It’s a highly functional, stand-alone option for spacious bathrooms. The material is standard acrylic, a popular choice that’s durable and lightweight. A fiberglass reinforcement provides extra strength and durability. The tub has a double-walled construction that retains heat for longer to keep you warm. An ergonomic interior conforms to your body’s shape for ultimate comfort. There’s a headrest to provide relaxing comfort. Woodbridge is an oval, stand-alone tub with a more than standard length of 67 inches. The width is 32 inches, and you get a soaking depth of 13 inches for full body immersion. It holds up to 60 gallons of water. The tub comes ready with a drain and overflow assembly, so no need for extra installation. You can adjust the leveling legs for better stability. A center drain lets the water drain off faster. The drain tube comes in a flexible material, which makes it easy to fit an existing plumbing system. Woodbridge 67-inch bathtub makes a perfect combination of style, comfort, and functionality. Plus, there’s excellent customer support and in-depth installation manual. It makes an excellent choice for a spacious bathroom. Empava Spa is a modern bathtub, but with a more versatile design. You can customize it in different ways for a striking look. It’s a tub with a modern curve along the top edges. Empava leaves room for a tub filler, which you can choose depending on the style you desire. It makes it much easier to complement any bathroom decor. The interior has a unique curve, one that molds to the shape of your body for ergonomic comfort. Acrylic and fiberglass make durable layers that put up considerable resistance to scratches and chemicals. A high gloss anti-microbial surface makes it an easy-clean, sanitary option. The tub comes in a one-piece construction but manages to retain heat well. Whats more, it feels lighter than two-piece models of a similar size. A center drain empties faster. It has a recess that keeps you from scratching yourself when shifting inside the tub. The tub is 32 inches wide, and according to the manufacturer, it can comfortably fit two people. An immersion depth of 21 inches makes a complete soaking experience. When full, it holds 58 gallons. You get this tub inclusive of the drain and overflow. Sturdy metal legs adjust easily for stability. Empava offers excellent quality and an immersion depth that’s deeper than standard. It retains heat, but not as good as the two-piece models. However, stylish design and easy customization make it a worthy competitor you can’t afford to ignore. Barnet tub might have the specs of a standard bathtub, but the luxurious comfort it offers is above standard. It comes sleek, smooth, and with a pure white color. The tub is 100-percent acrylic to provide all the benefits of the best acrylic bathtub: lightweight construction and durability. It heats fast, yet cools slowly for excellent heat retention. You get an oval, modern look that makes a striking addition to your bathroom. 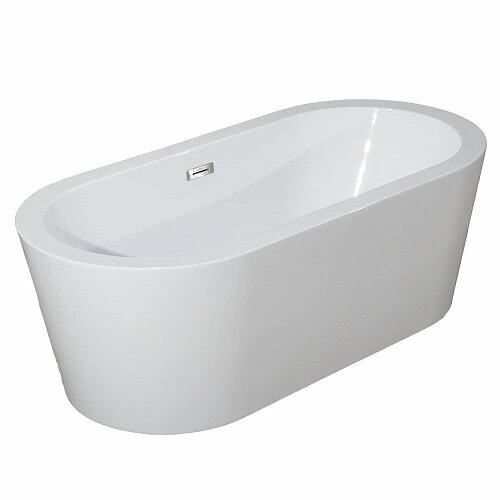 Barnet tub is of average size, 61 inches long and 30 inches wide. It accommodates 52.8 gallons and soaks up to a depth of 14 inches. An optional flexible drain tube attaches easily to existing pipes to save time and upgrade expenses. An already fit drain and overflow offer peace of mind and eliminate the risk of flooding. A center drain empties faster and makes cleaning a breeze. Leveling feet provide adjustable stability on uneven ground. The legs tuck underneath for a flush look. The glossy finish and modern look make this tub a bathroom centerpiece. It’s a smaller version of freestanding tubs, one that fits most bathroom spaces. An oval tub with a unique style for every home. It offers soothing comfort, durability, and excellent quality. A quality acrylic material makes it warm to touch and light to move. Its smooth, glossy finish doesn’t crack, fade, or scratch to provide long-lasting beauty. 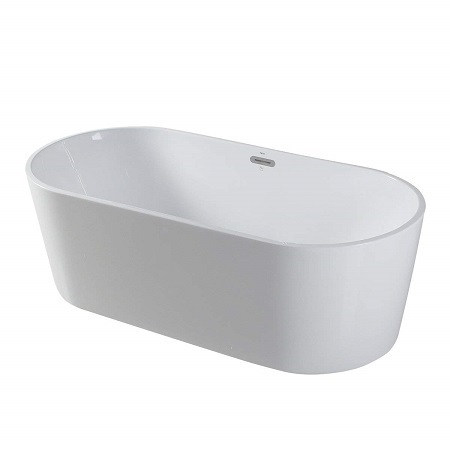 AKDY is a freestanding, modern tub with an oval shape. A curvature on the sides adds a simple yet elegant look to any bathroom. It creates an artistic look with high functionality to match. On the interior is a slight contour, which is a bonus for users who want to recline. The tub is 31 inches wide and soaks to a depth of 15 inches at a full capacity of 66 gallons. It’s more like a little pool that provides relaxing, total immersion. A versatile design makes installation pretty straightforward. You can install indoors or out to match any design ideas you have in mind. It includes all fittings necessary for installation. You can adjust the leveling feet for maximum stability on any surface. AKDY makes an excellent option as far as acrylic tubs go. The appearance is far more striking when you pair with contemporary bathroom fittings. Plus, it’s a freestanding tub, which makes setup is a piece of cake. For starters, this is the Allure Mini tub. It makes a perfect option for users who want a freestanding tub but lack the space for larger models. The tub has a seamless construction for higher strength to weight ratio. It’s easy to move, yet sturdy enough to support up to 660 pounds. Two-piece, 100-percent acrylic structure allows it to warm faster and retains heat for longer. A smooth, glossy white finish keeps it free from scratches. According to the manufacturer, the tub can go fade-free for at least ten years. It’s 59 inches long and 30 inches wide, an impressive size for a mini tub. The tub holds 55 gallons at full capacity and soaks to a depth of 14 inches. A slanting backrest offers reclining comfort that allows you to sit back and relax. Solid steel feet provide maximum support and stability. The package includes drain and overflow fittings. Allure Mini tub is a compact option for you and your kids. It’s durable, long-lasting, with a unique design that provides comfort. Let’s face it; no one particular tub can satisfy the needs of all people. But there are a few pointers you can use to narrow down to a bathtub that best suits your personal needs. Here are some of the most important factors to keep in mind. Bathtub material is more of a personal preference. But that doesn’t mean all materials offer the same benefits. Acrylic makes a popular choice. It’s slow to lose heat and warms faster. Acrylic is durable and lightweight, especially with fiberglass reinforcement. On the high-end of the price tag are cast iron, copper, and marble. Cast iron is sturdy, durable, and preserves heat well. Marble and copper bring in beauty and unique aesthetics. While selecting the material, keep in mind other issues, such as weight and maintenance. Pay close attention to bathtubs made of stone or metal. Such tubs tend to be heavier and may require additional works during the installation process. Settle for a massive tub if your bathroom floor can hold its weight and the pressure of the bathtub. It’s very crucial where the bathroom rests on the upper level. A simple, lightweight bathtub is your best choice for a floor without reinforcement. In so doing, consider the freestanding varieties. A bathtub isn’t a “one size fits all” unit. As yourself, who’s going to use the tub? Furthermore, consider the available space in the bathroom to determine the right size. Bathtubs come in different sizes to fit various users. Plus, there are tubs for a specific age group. In general, a taller person needs a longer bathtub. A fat user will do well with a larger width. Kids, on the other hand, are safe with shallow, compact tubs. Consider installation type. For instance, a freestanding tub requires more space than an alcove bathtub. Tubs come in a wide variety of color and styles. Most bathtubs are white, a color that offers a classic look. It complements most bathroom decor and styles. A modern bathtub complements the look of your bathroom more than the typical tub. Remember, the best soaking bathtubs that offer a unique aesthetic and style cost more than those with standard looks. Choose a tub that holds onto heat for longer. Most soaking bathtubs provide this option, but there’s always the best to choose from the available options. Q: What is a soaking bathtub? A: It’s a larger version of the standard bathtub with more immersion depth ideal for relaxation purposes. Q: What’s the preferable depth of a soaking tub? A: A good soaking bathtub should have a minimum immersion depth of 14 inches. Some models have depths of more than 22 inches. Q: How long is a soaking bathtub? A: Typical length is from 60 to 72 inches. Q: What’s an alcove tub? A: It’s a bathtub that rests against the walls. Most often, they’re an excellent choice shower for saving space. Q: What’s the capacity of a soaking tub? A: It depends on the size. A small bathtub holds 40 gallons while a large holds 100 gallons or more. 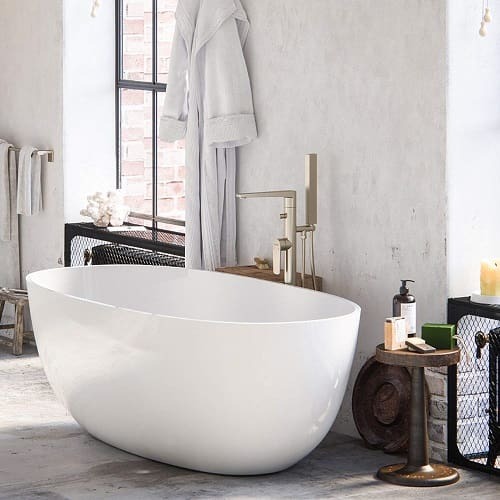 A soaking bathtub makes a stylish add-on and helps you unwind. But you need the best soaking tub to get the most benefits. Luckily, we have the list of options available to you, and it rests upon you to select one that best matches your personal needs. The best deep soaking bathtub will take your bathing experience to a whole new level. Be sure to use the guide above to narrow down on one specific model. After all, you don’t want to make a choice that you’ll regret, do you? We’re open for comments or experiences you might want to share.